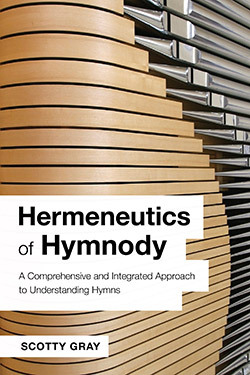 Scotty Gray’s Hermeneutics of Hymnody is a comprehensive and integrated approach to understanding hymns. It is unique in its holistic and interrelated exploration of the biblical, theological, liturgical, literary, musical, practical, and historical/biographical/sociocultural dimensions of one of the most basic forms of Christian literature. A chapter is devoted to each of these seven broad facets of hymnody and relates that facet to each of the others. Those who write hymns, compose hymn tunes, study hymns, compile hymnals, select hymns and tunes for the ministries of the church, and those who read and sing hymns can benefit from a keener sensitivity to and a deeper understanding of how these facets are vitally interrelated in fine hymnody from various times and traditions. This approach grew out of years of planning and leading hymns, teaching hymnology in a graduate theological seminary, chairing site visits to universities and seminaries for national and regional accrediting agencies, and extensive travel and living in other cultures. Scotty Gray devoted thirty-five years to graduate theological education during his career as a seminary professor, acting dean, vice president for academic affairs, and executive vice president. Prior to his academic career, Gray served as minister of music and education in churches, and for years during his academic career, chaired site visits to universities and seminaries for national and regional accrediting agencies. Gray and his family have lived in England, Germany, and Switzerland. In retirement Gray served as director of educational outreach ministries in his church, coordinating programs of ESL, literacy, citizenship, computer skills, and life skills. Gray continues working with international students who are preparing for SAT, GED, and TOEFL. He and his wife, June, have two daughters, Lynne and Amy, four grandchildren, and two great-grandchildren. Gray’s hobbies include reading, playing the piano, and researching family history. This book calls for hymns to be taken seriously. It could be read beneficially by authors and composers as well as hymnologists. . . . It uses as examples a huge number of texts of very varied styles though these are always essentially Christian and Trinitarian. Historically it reaches from the time of the early Church to the opening years of the twenty-first century with the likes of Thomas Troeger pointing us to a future which beckons us to transform our writing without distorting its content. This is not a light nor an easy book, yet it is beautifully written. Any person who is responsible for choosing the texts and tunes that are placed on the lips of their worshiping community each week owes it to that community to thoughtfully contemplate this book.
. . . insightful, comprehensive coverage of the topic . . . welcome and timely. . . . a valuable resource. . . . reminder for composers, worship leaders and worshippers, to pursue enduring and edifying expressions that are permeated with spirit, heart, truth, skill and understanding.